The Glitterbomb is an explosion of stones that covers a beautifully constructed peeptoe pump. 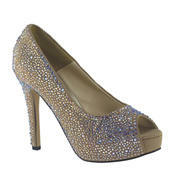 A platform with the 4 inch heel provides support and improves comfort. Make a statement by wearing the Glitterbomb to your next special occasion.